Thank you to the artists for sharing your crankies! 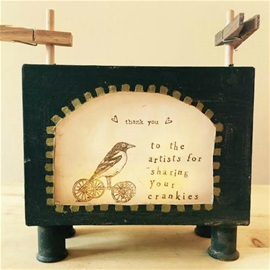 Many thanks to the crankie artists around the world, for sharing your work with us. Inspiring! Created by Julie Vallimont called Bein' Green. This is a collection of crankies from artists from the US and beyond. Click here to watch. Deborah Hunt with one of her multi-scroll crankies! This page features crankies with unusual boxes. Sometimes the design of the box is related to the story. I continue to be amazed and inspired. Here are just a few examples LINK. Some matchbox crankies made my me! This is a collection of miniature crankies. The scrolls are between 1 and 5 inches high. The boxes are made from a variety of materials and there is one late 19th century moving panorama with a tin box. Find them all here. Katherine Fahey and friend, behind the box with shadow puppetry. In puppetry circles, crankies are sometimes called "moving backdrops". 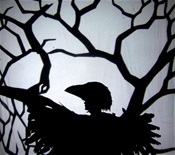 Shadow puppetry and other forms of puppetry can make the crankie come alive. Watch them here. Crankies made by children in schools and music camps. Some crankies accompany a song and some accompany a narrated story. See them here. From Katherine Fahey's Crow River Song crankie. This collection of crankies includes folk songs, a poem, a Native American folktale and a 16th Century Scottish piping piobaireachd. Watch them here.